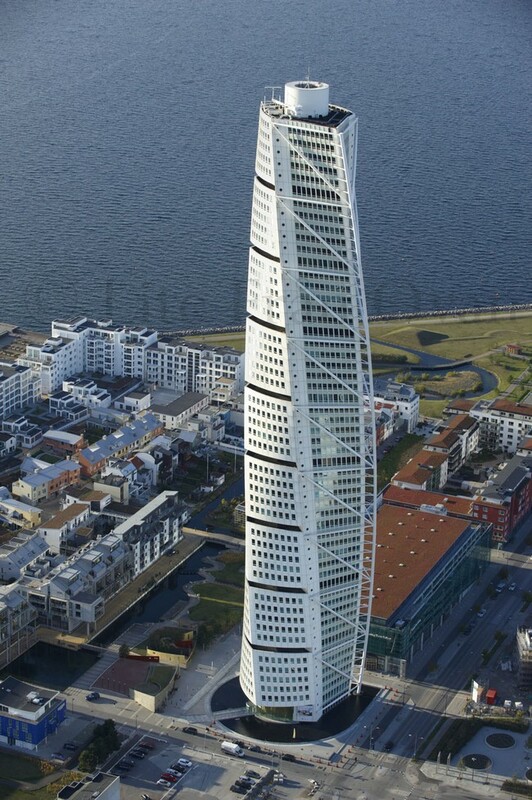 Santiago Calatrava’s “Twisted Tower” residential building in Sweden. North Carolina Modernist Houses (NCMH) will open 2015 with two back-to-back Durham events: a special screening of a film about world-renowned architect Santiago Calatrava and a “Thirst4Architecture” (T4A) design networking event at Kontek Systems. The film will be shown at Full Frame Theatre, 320 Blackwell Street, on the American Tobacco Campus in Durham. Tickets are $10 per person at the door. Space is limited so early arrival is recommended. Sarah Sonke of ModTriangle, specializing in Modernist real estate sales and auctions, is sponsoring the entire movie series. The Calatrava film’s specific sponsor is Center Studio Architecture, specializing in modern downtown Durham development. The following night, Thursday, January 8, Frank Konhaus and Wes Newman of Kontek Systems will host NCMH’s first T4A networking event in 2015 in their downtown Durham headquarters at 318 Holland Street from 6-8 pm. Free and open to the public, the event will include an exclusive behind-the-scenes tour of one of Kontek’s audio/video design and integration projects in downtown Durham. T4A events connect hundreds of Modernist design enthusiasts in a casual environment. The host business provides refreshments and other entertainment while attendees build relationships, create strategic alliances, and make new contacts. Emilie Huin of 501 Realty sponsors the 2015 T4A series. NCMH is an award-winning non-profit organization dedicated to documenting, preserving, and promoting Modernist residential design across the state. For the dates and locations of future movies and T4A events, visit www.ncmodernist.org. North Carolina Modernist Houses (NCMH) is an award-winning, 501C3 nonprofit organizations established in 2007 and dedicated to documenting, preserving, and promoting Modernist residential design. The website is now the largest open digital archive for Modernist residential design in America. NCMH also hosts popular architecture events every month and frequent home tours, giving the public access to the most exciting residential architecture, past and present. These tours and events raise awareness and help preserve these “livable works of art” for future generations. For more information: www.ncmodernist.org.